Patt Sue Ann (First left) Commercial Director of DSG Malaysia, Dahlia Shazwan (Third Right) and Yeoh Aik Cheong, Managing Director of DSG Malaysia, together with mothers and baby models, presenting PETPET’s new range of baby diapers. PETPET introduced its new and improved range of diapers that promises to keep the little ones happy and comfortable for longer periods of time. The new range of PETPET diapers utilises non-woven fabric and absorbent material processing and moulding techniques, allowing more comfort and a quick drying mechanism that keeps babies comfortable and happy for up to 10-hours a day. It is a dream come true for parents. Being parents of two boys, when they were babies I been through the nights where I woke up to change my baby diapers. Sharing is caring now new parents are lucky to have to choose suitable baby diaper for their little ones. You can check out the photos I have taken during the PetPet launch event, it was held at MYDIN Subang Jaya, the PET PET roadshow at MYDIN is until this Sunday, please click on the link to see. 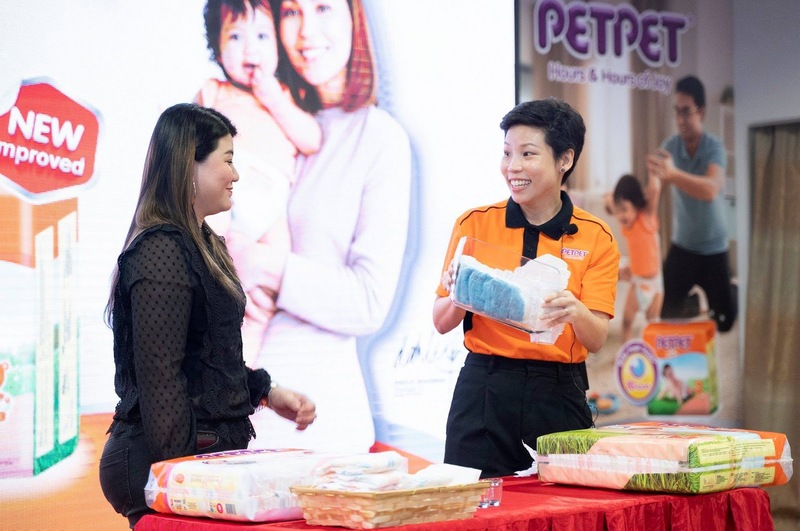 Patt Sue Ann (Right) conducting a demonstration on the absorbing power and durability of PETPET’s new diaper range to a guest. This is good info for parents who are planning to shop for diapers. PETPET will be setting up special promotion booths all around the Klang Valley starting 19 March 2019, special premiums, games and deals will be available at the PETPET roadshow. Good day to everyone, welcome to my parenting blog. Today sharing with you about getting your "couch kid" to be active. I am mom of two boys, and being parent I need to understand of my kids, I know that my boys fitness personality are non-athletes. What are the barriers of kids being active? Low interest, school demands like tuition, lack of active role models, parents' fear of letting kids play outdoors, etc. 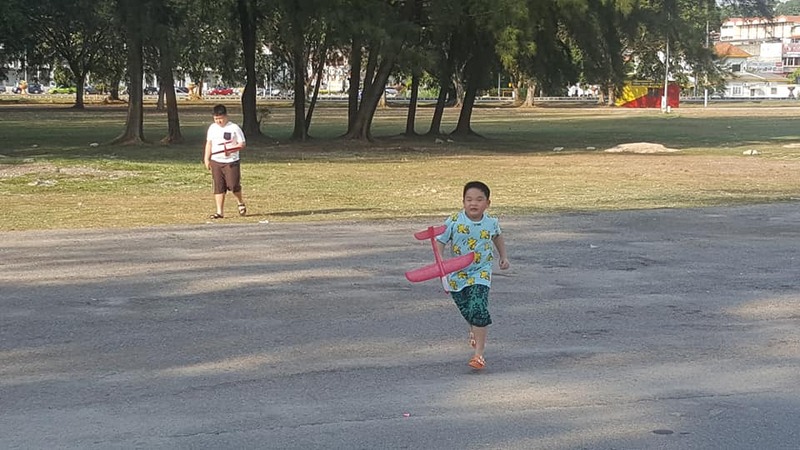 I can't agree more due to hot and humid weather in Malaysia now, I fear of letting my kids to play outdoors. 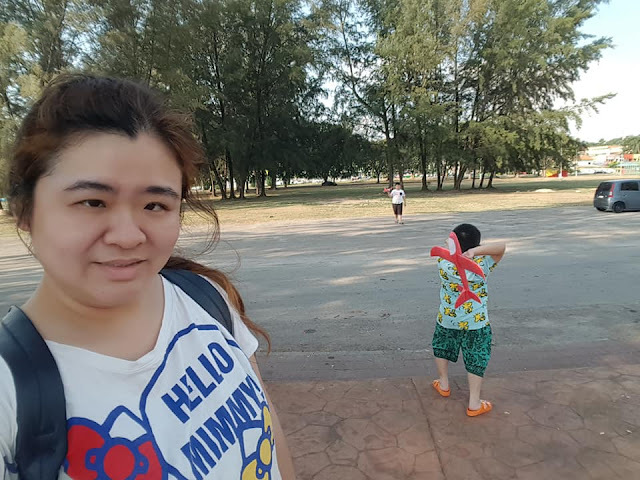 But we cannot be forever keep kids at home, so we need to see the timing to get activities such as visit lets say the playground. If we are going in the evening 6pm, put on sunscreen and mosquitoes repellent. What motivate my kids to be active? Being active myself of course, parents are the role models to our children. 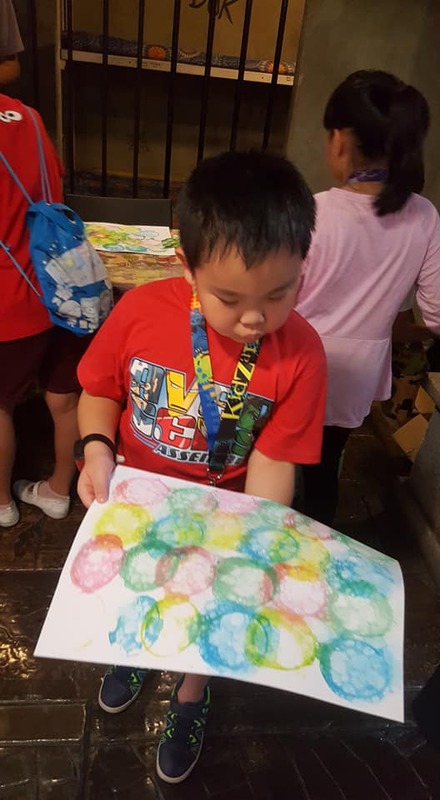 One of the recent fun activity that my son likes at the KidZania is the bubbly artwork, we went not long ago for the KidZania Kuala Lumpur 7th Anniversary. He had a good time creating the bubbly work using a straw and cups of water color for the artwork. Benefits of being active, especially in sports - what skills are developed? My kids stay active when they have the time to visit the outdoor for example fun time of flying the planes. It will be a nice good sweating time while playing. Whenever they fly the planes and chasing and running after it to collect it. Everyone has got busy lifestyle, it's important to keep our lifestyle balance. We spend quality time together whenever we can. Both my sons now studying at different school as his elder brother is now 13 years old. Both of them different time of studying and also attending tuition. I try to keep them active and spend quality time together as much as possible. It's weekends that we can get together more often. My youngest son likes the challenge of wall climbing, he knows some day he will make it to the top. Sports is more than a healthy pastime, it improves coordination, builds confidence and helps develop social skills. Games can also teach kids about cooperation and teamwork; these are the important aspects of growing up. Last year, KidZania has got the sports programme of Football Fever. * Futsal: Practice dribbling skills in a 2V2 match, or try to score a goal while blindfolded! * Foosball: This intense game puts hand-eye coordination to the test. Great for all ages! * Subbuteo: Try the new table-top football phenomenon! * Football Video Game: This virtual challenge brings the game to life in a different way! 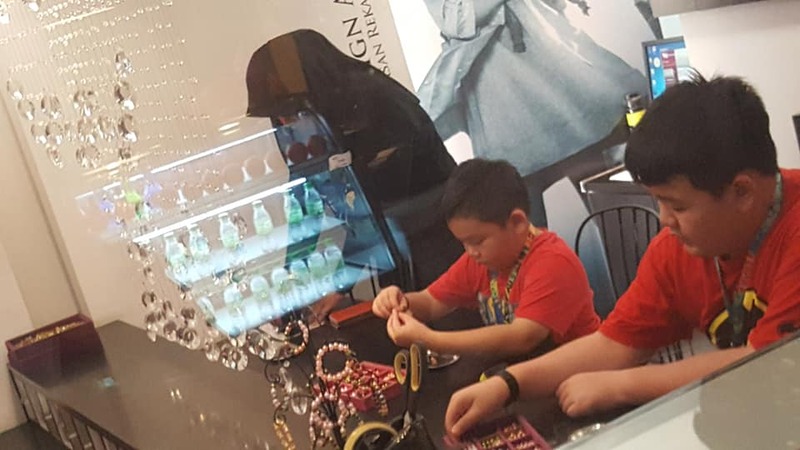 Part of the activities that we can find in KidZania is the bracelets making at Jewelry shop. 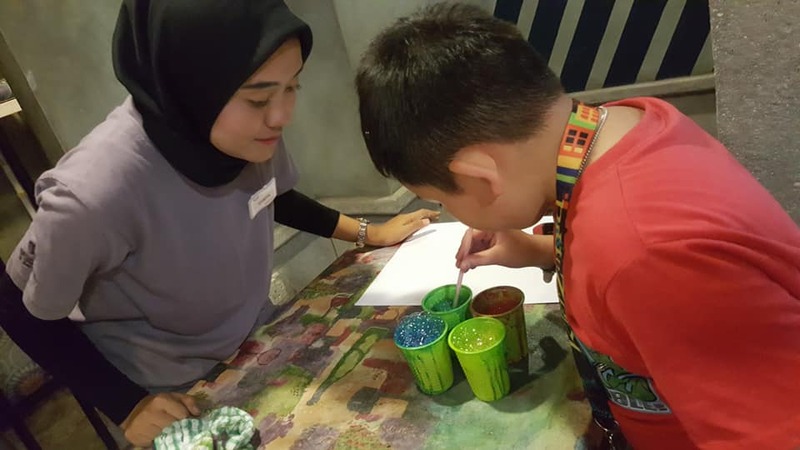 This is good to keep them focus, active in mind and calculation skill as involve in thinking on how to put the beads together and making a bracelet. 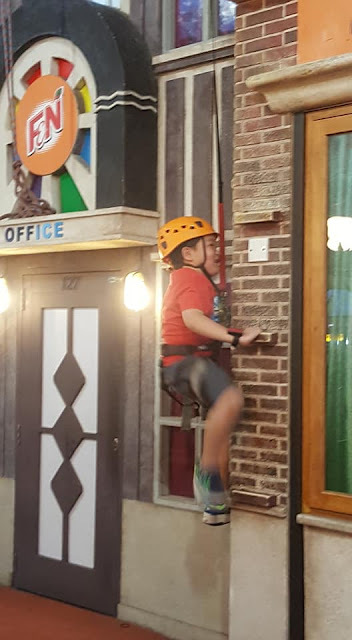 There are so many fun activities can be found at KidZania namely Researcher, Bottling Operator, Tourism Officer, Jeweller, Car Dealer, Actor, Nurse, Judge, Police, Fire fighter, Magician, Cashier, Modelling Class, and many more. from 9.00 am to 6.00 pm, Monday to Sunday.